Getting experiential at the eleventh hour. 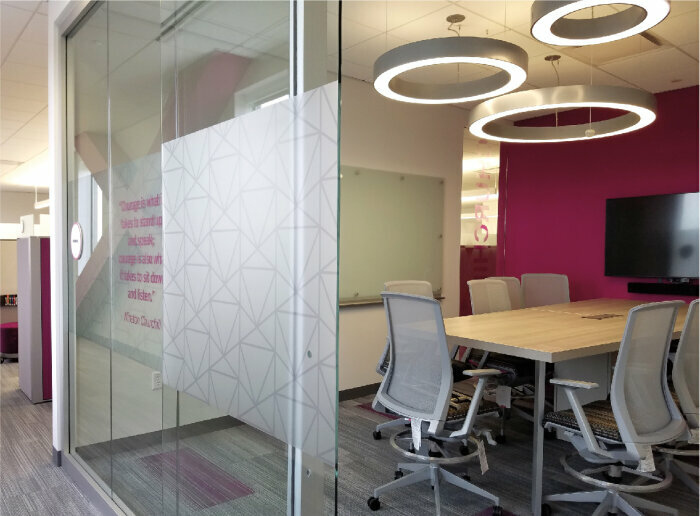 With the construction of its new 435,000 square foot Global headquarters nearing completion in Lowell, Massachusetts, Kronos, the workforce management and time-tracking company, approached us, with an ironically time-based challenge. They needed to design and implement a sophisticated experiential graphics, wayfinding and signage program throughout the entire campus in a matter of just three months. For any other company in our industry, this compressed schedule would have been daunting, if not a complete deal-breaker. But Takeform is designed to serve large organizations with demanding challenges, so our team embraced the project and saw its scale and schedule as a motivating challenge and exciting creative opportunity. Watch more videos like this one. It began with an initial meeting with the Kronos Design team. They had an overarching vision for what they wanted to achieve and they'd already developed a floor-by-floor wayfinding color strategy, but the many demands of this new headquarters found them without internal resources dedicated to the experiential graphics program. They were intrigued by our Design/Build model, especially our forty-plus member Experiential Graphic Design (EGD) team. 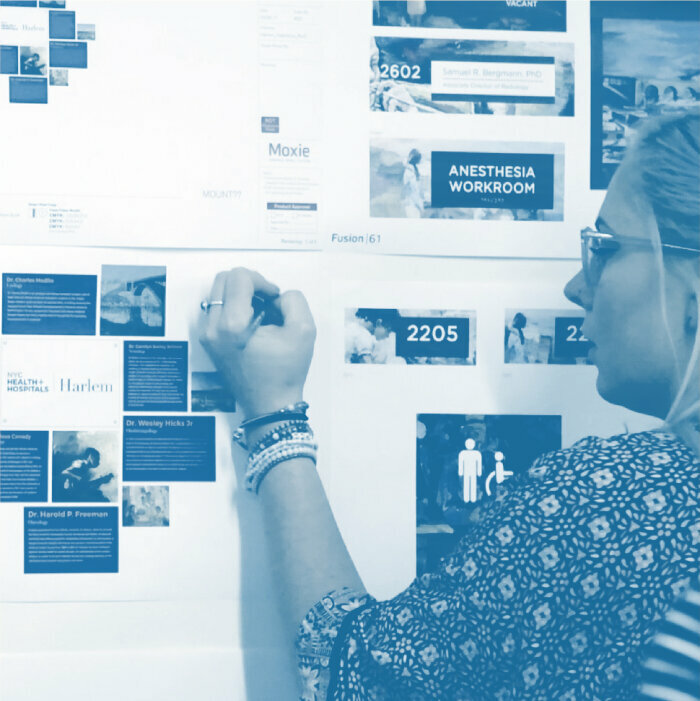 With national-caliber wayfinding experts, award-winning graphic designers, planning tacticians, and imaging specialists, it's a team with broad experience that adapts to the specific needs of each client. 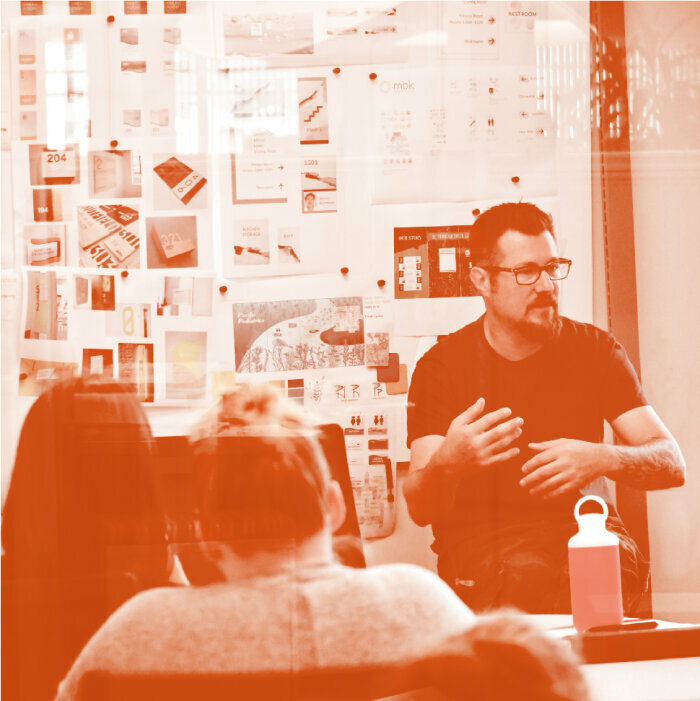 It can take the creative lead for those lacking their own resources, or it can play a valuable supporting role for our highly-capable A&D clients. Or, as in this case, our team will collaborate closely with an organization's inside design or marketing staff as part of a larger group. We speak a common language. Being able to speak a common creative language with the Kronos designers made a nearly-impossible task, doable.They were able to readily provide general direction in terms that made our branding and wayfinding objectives clear. Thanks to our two teams' combined experience, we were able to clearly define realistic project parameters that would meet the goals without escalating the scheduling challenges. 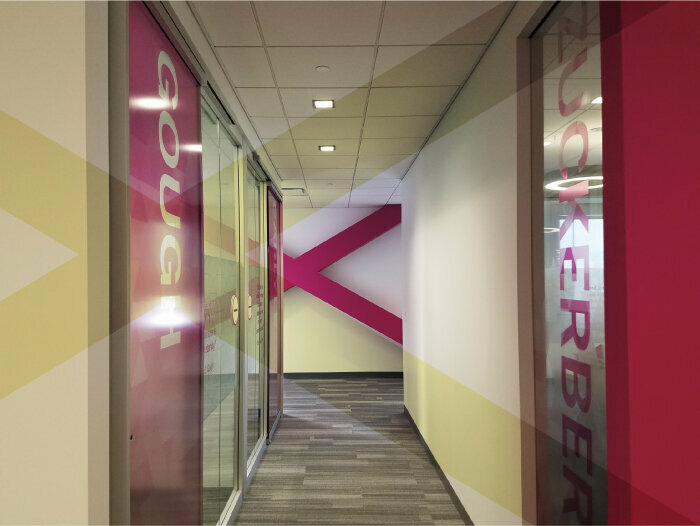 Together, we envisioned a bold, sophisticated graphic approach – one that would energize staff and provide subtle wayfinding cues for Kronos employees and visitors. The desire was for a clean, contemporary look free of visual complexity. 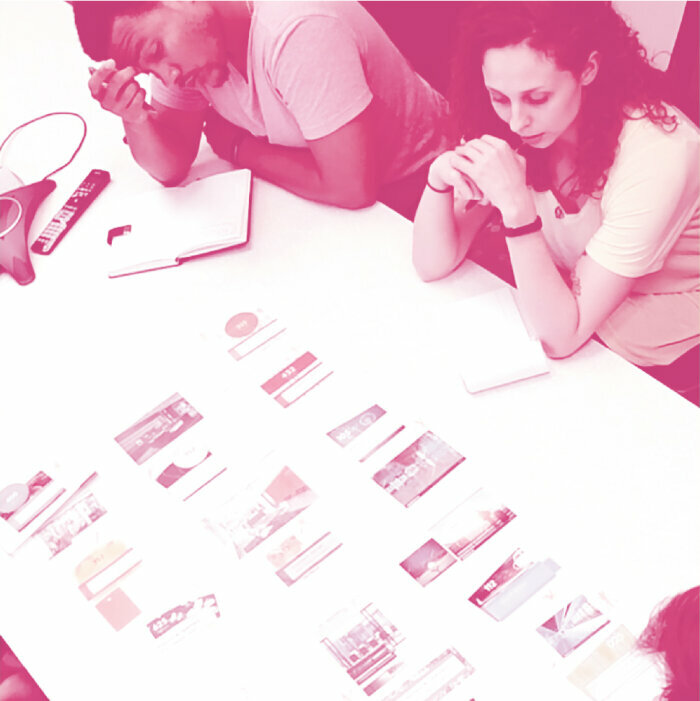 “With the demanding schedule in mind, we put our entire design team on the project and delivered almost 30 design concepts in just one week; which gave our client the reassurance that a thorough range of directions had been explored." "When designing a solution for Kronos Global Headquarters, I wanted to complement and contrast the strong, clean lines within the logo and architecture. The circular signs and the office space in which they live have strong geometry. In contrast, our graphic patterns and artwork offer an unexpected, almost playful attitude. Together they communicate both order and inspiration." The Kronos logo and brand standards were the foundation for our creative explorations. Based on the company's roots in employee time tracking, the circular Kronos logo and its intricate line work are suggestive of a clock face. Further inspiration was taken from prominent architectural elements within the space. Dominant “X" shaped structural elements were, at first, seen as visually detrimental to the space,until it was decided to transform them into focal points through the application of bold color. The geometry of these elements and the logo's graphic style combined to inspire the selected design direction. Our team knows how to deal with tight schedules, so through a focused effort, we completed the design phase of the project in just one week. 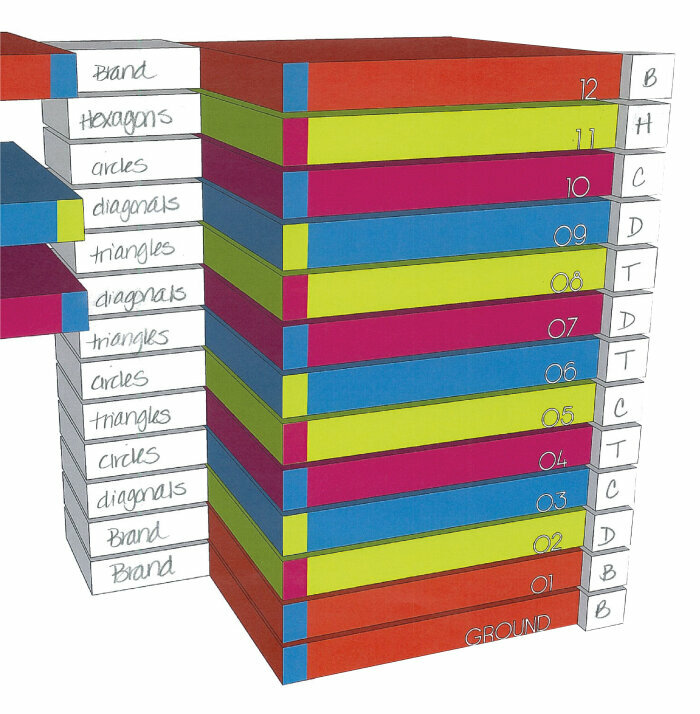 A wide range of design concepts were proposed. The chosen solution included four engaging geometric patterns and a bold color palette. 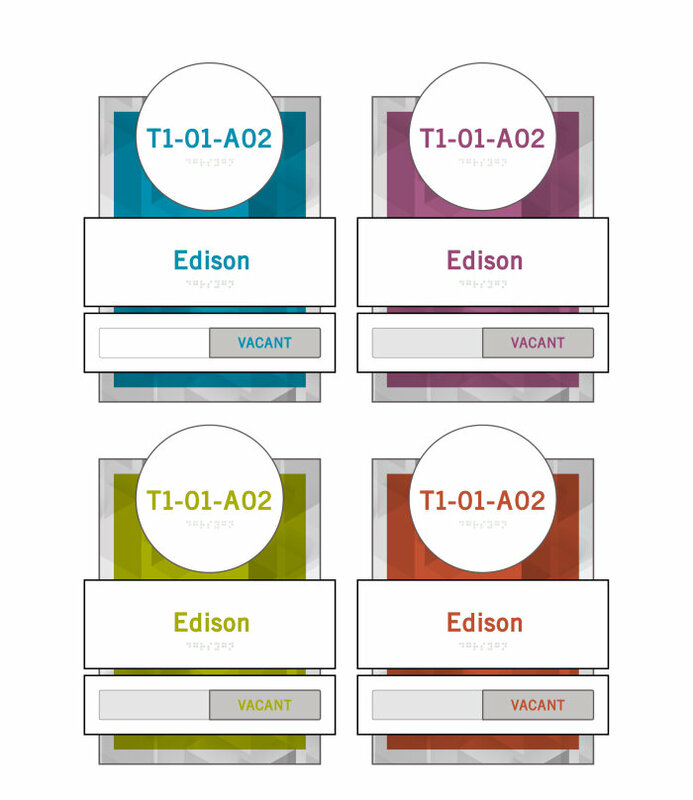 The system dictated that each floor is assigned its own visual identity by combining one of the graphic patterns with the level's specific two-color sub-palette. This zoning strategy is most evident in the elevator corridors but is carried through the entire floor in creative ways. 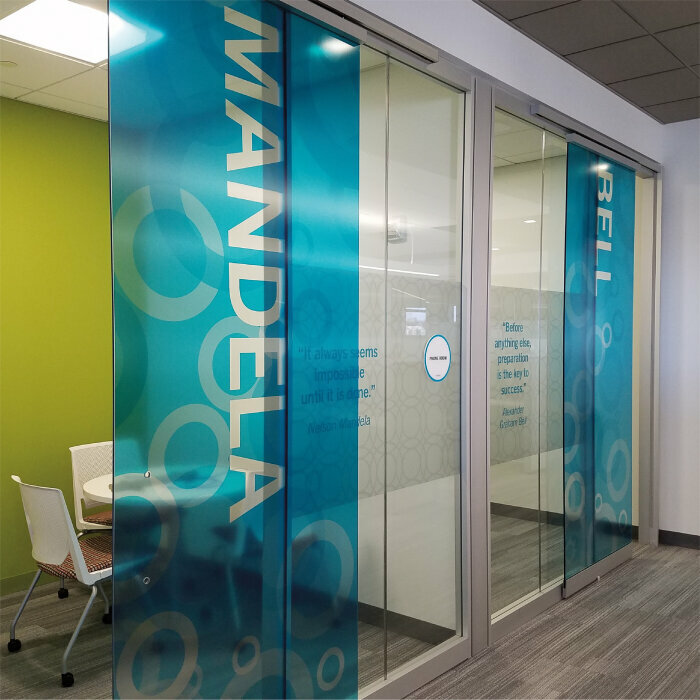 For instance, window films provide staff inspiration, room identification, and privacy for each of the conference and meeting spaces. 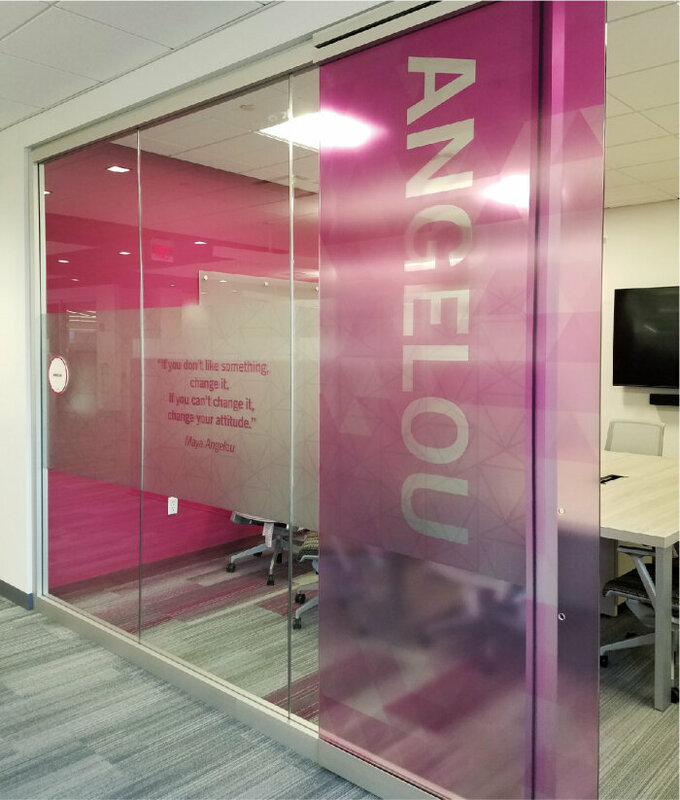 The window film designs include the floor's color scheme and graphic pattern as well as the name and a quote from an inspiring leader or innovator. Despite the demanding schedule, we didn't limit innovation or creativity. 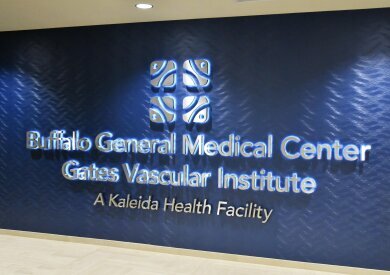 With the circular logo and various round architectural elements in mind, we designed and engineered a circular sign system. This approach seems simple enough until you consider the manufacturing and installation demands of round signs that offer no straight edges to act as the alignment reference typically required for such processes. It took some extra problem solving, but the on-brand result was well worth the effort – it's just one example of how we deliver on every project. Kronos, like so many organizations, came to us realizing the branding potential of their built environment. Their space provides an experience that will either work for them or against them. 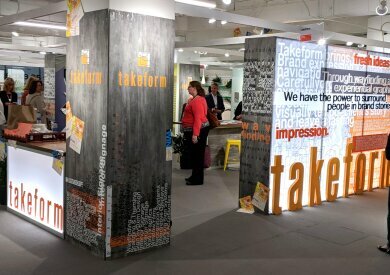 Experiential graphics and wayfinding elevate people's engagement with space and move them to connect with the organization more closely. But Experiential design and implementation are refined disciplines. Effective execution of such projects takes a wide range of skill sets, which are often mistakenly assigned to separate suppliers. This approach negatively impacts schedule, budget, and outcome. Few companies have the talent and infrastructure to deliver at every level. So, whether you're considering experiential graphics at the eleventh hour or you have a little more time, we look forward to hearing from you.